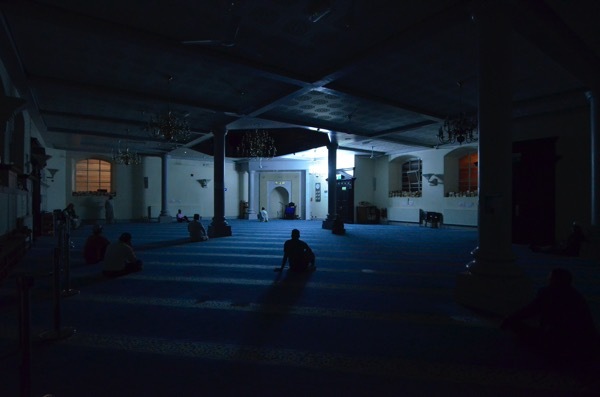 At 2:45 am, the muezzin walks up to the front of the prayer hall, places his hands besides his ears and makes the call to prayer, heralding the beginning of the new day. A dozen or so people sit on the floor. A dim light from a brass chandelier illuminates some but most are bathed in the darkness of night. Their silhouettes brush against one of the large pillars, besides an ornately panelled door, legs crossed in quiet thought and contemplation. 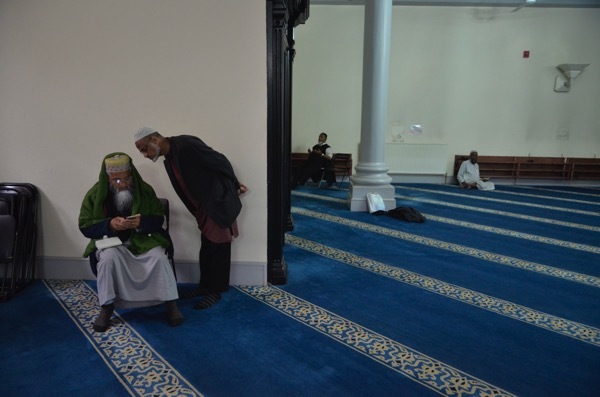 Some have their heads down, others finger prayer beads or leaf through ancient pages of a Quran. The muezzin’s voice is so clear it cuts through the shadows and rouses the assembled. Most look like they may be over the age of sixty, with long wispy tendrils of white beards, and shawls over suit jackets over jumpers and long worn hats. They hobble on walking sticks – some have two – slowly and methodically to the front, where they line up. A few, even less mobile, sit on metal fold-out chairs from which they will perform their prayer. 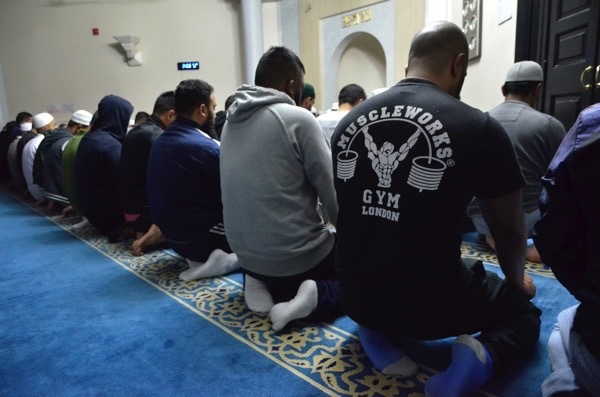 At 3:00am, the numbers increase with younger men in attendance. 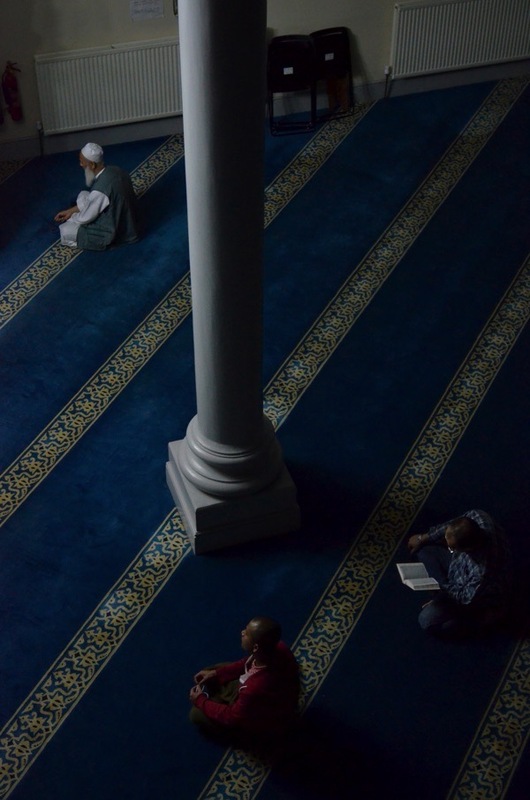 All follow the imam in kneeling, prostrating and standing. This is the first of the five obligatory prayers which punctuate the day. They are set pieces, each with their own routines and recitations, taught in childhood and practiced and performed over a lifetime. 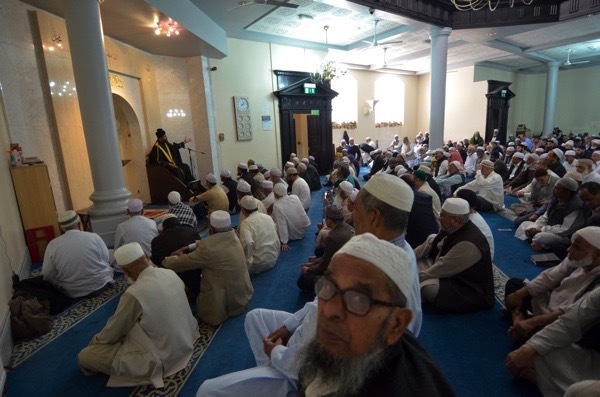 Finally, the imam faces the congregation, brings his open hand to his chest and asks Allah for forgiveness of sins, to be spared from ill-health, and peace. 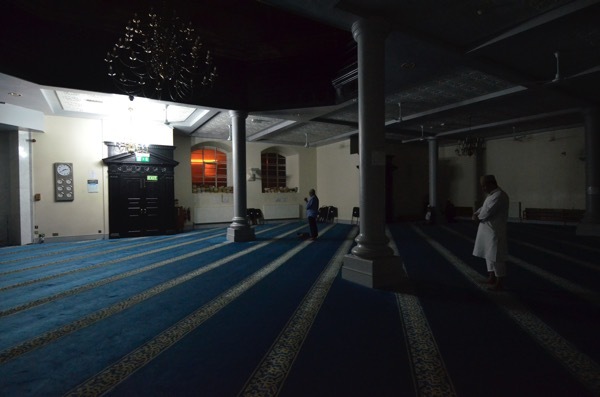 The Fojor prayer draws to an end and the men leave the mosque, walking back out onto Brick Lane, drenched in amber streetlight and with a stray night clubber ambling back home. I ask my collaborator, photographer Bob Mazzer, how he finds his first experience of the place. Bob wears an embroidered hat, one that looks like he had bought it on a trip to India, and his camera dangles low from his neck. “It was incredibly moving,” he whisperes. 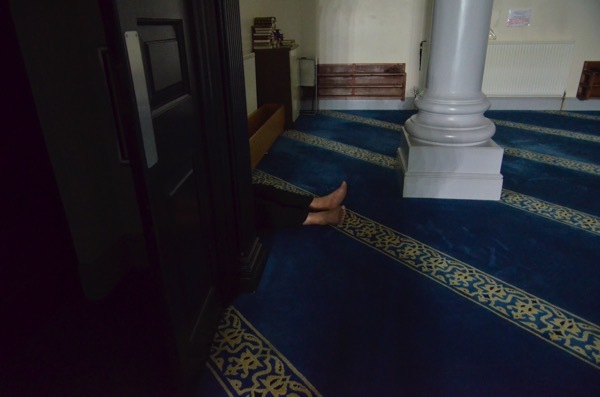 It has been a long time since I have been inside of the mosque and I surprise myself that I feel the same as Bob. 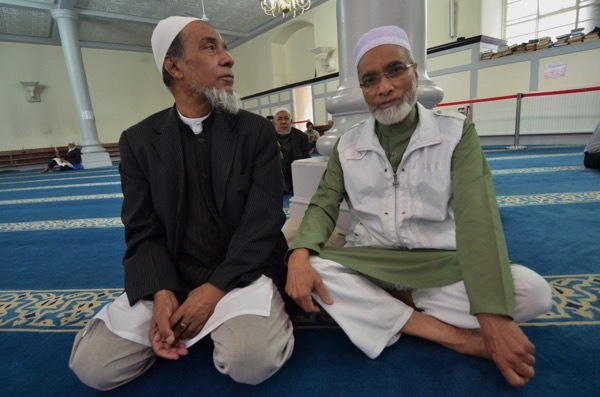 I am reminded what an important role the mosque has played in the life of my family. 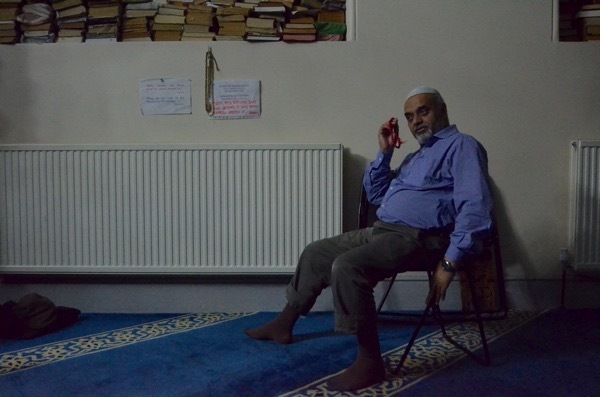 It is considered an honour if an imam from the mosque attends your house for an event, whether social or spiritual. My siblings had Quran classes on the top floor of this building. When my brother had a traffic accident and ended up in a coma, prayers were said for him there. 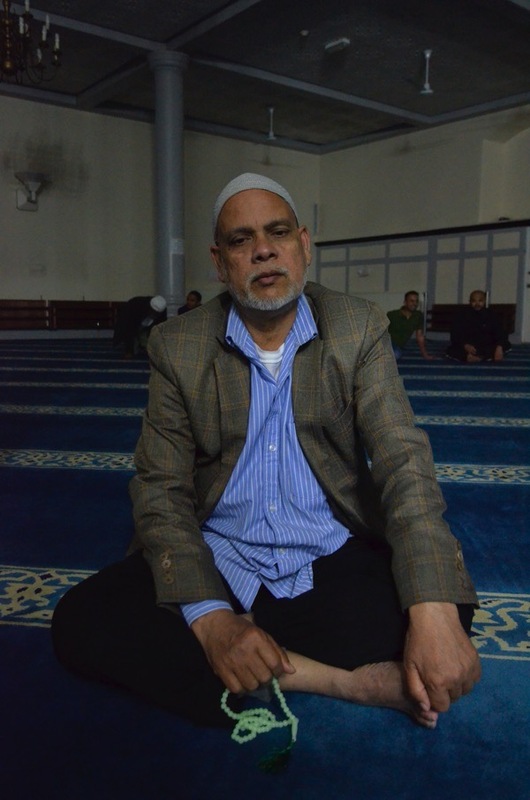 The very first time I saw my father cry was at the mosque. Much later, a funeral service was held there for him attended by many who had known him in the sixties, when he worked a machinist in a leather jacket factory opposite the beigel shop on Brick Lane itself. There is nothing that quite symbolises the unique quality of Spitalfields and the communities that have forged a home here as much as this building which looms soberly and sombrely on the corner of Brick Lane and Fournier St. It has been and continues to be a place of sanctuary but – more than that – it is both a witness and an agent in connecting and linking the roots and routes which span time, transition and imagination. 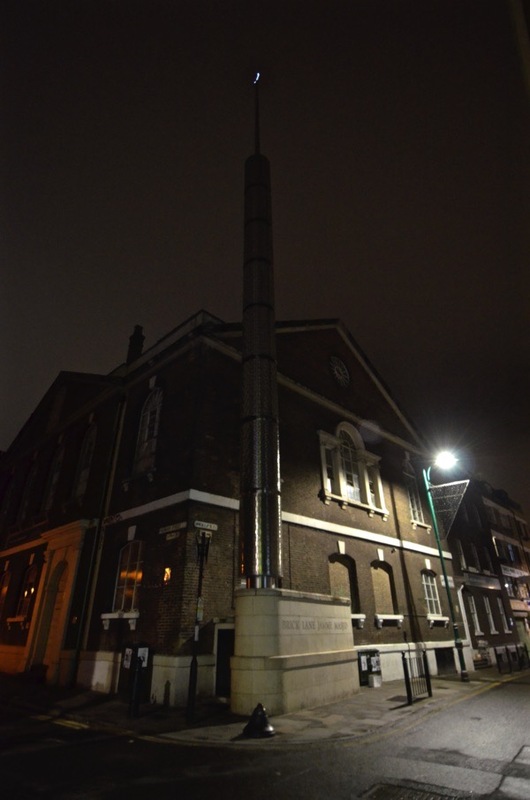 It was constructed as a church in 1743 by Huguenot refugees who fled to the East End of London escaping persecution in France. Naming it the Neuve Eglise (New Church), they worshipped here until the late nineteenth century when they prospered, assimilating into wider British society and moving out to the suburbs. With a dwindled population, the building changed too – from hosting Wesleyan Methodists to becoming headquarters of the Society for Propagating Christianity among the Jews. By then, Yiddish, Russian, Polish and Lithuanian were the dominant languages spoken on the streets, as Jewish refugees from Eastern Europe escaping pogroms settled and made home in the gaps and spaces left by the Huguenots. In 1891, the building changed hands again and the Machzike Hadath (Great Synagogue) opened which served the population for over seventy years. It survived the First World War intact, but a bomb destroyed the roof and it was gutted by fire in the Second World War. Although it was repaired and reconsecrated in 1951, by then the Jews of the East End were already following the trend and moving to the suburbs. This was the time when Sylheti seamen from East Bengal, working on British merchant navy ships, arrived at the docks in Poplar. By the mid-twentieth century – following the turbulent break-up of the Indian sub-continent and later the creation of Bangladesh – their families and descendants, people such as my own family, came to live and work in the surrounding streets. 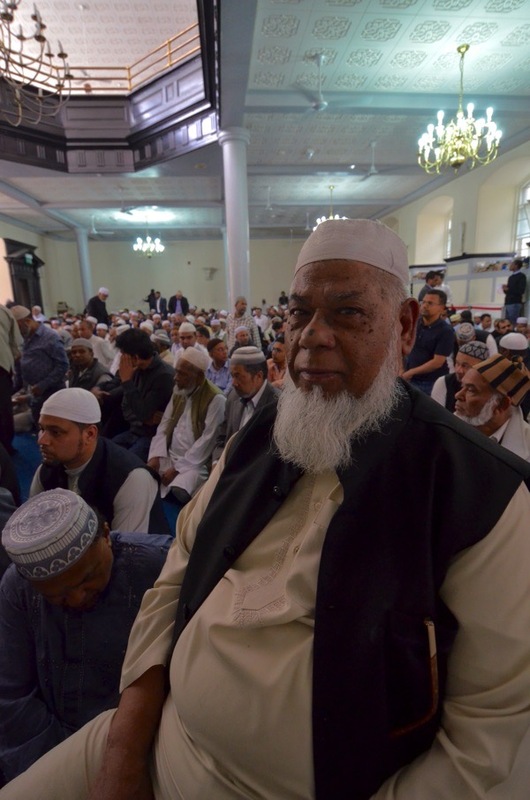 In 1976, the building was bought by donations from the Sylheti community and the London Jamme Masjid (Great Mosque) was established (later renamed Brick Lane Jamme Masjid). Bob & I walk up the wide rickety staircase that runs through the belly of the building to the mezzanine level above the main prayer hall. We stand in the pitch black unable to see anything. In the days it was a synagogue, this would have been the women’s gallery, where women and children sat and looked over the heads of men below. 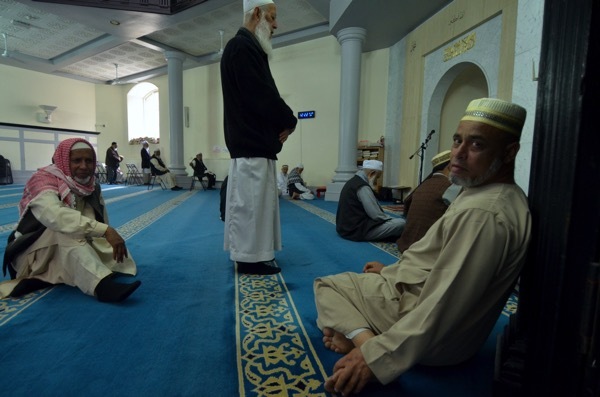 As a youngster, I came to the mosque with my father and brothers, and teenage boys and young men sat upstairs, with the older men downstairs. 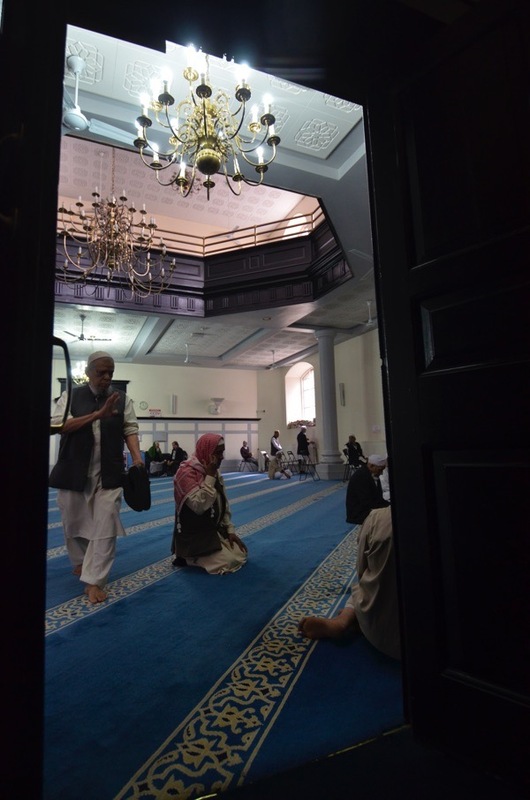 There is space for women in the mosque today, yet my mother has never set foot inside despite her intimate connection with the building. She is of the generation who could not attend, and carries on performing her religious duties and obligations at home. The two of us continue our journey to the top floor. 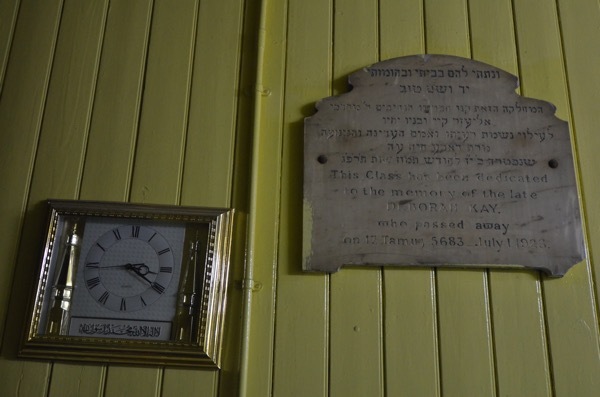 Tapping the wood panelling, Bob says it reminds him of the synagogue in the Bernard Baron Settlement down the road from the mosque which he attended as a boy and where he had his bar mitzvah. “Where did you grow up?” I ask him. Earlier, I overheard Bob talking to one of the older parishioners downstairs who asked where he was born. It is always odd what strangers want to know about you so early in the morning when the light is still opaque. “At the Royal London Hospital in Whitechapel,” Bob replied and the man walked off looking satisfied with what he was told. I too was born in the same hospital. We both start laughing, knowing what was to come, because Bob had gone to the same school as a child in the fifties. It was primarily a Jewish school then, in a poor Jewish neighbourhood. I went there in the eighties. 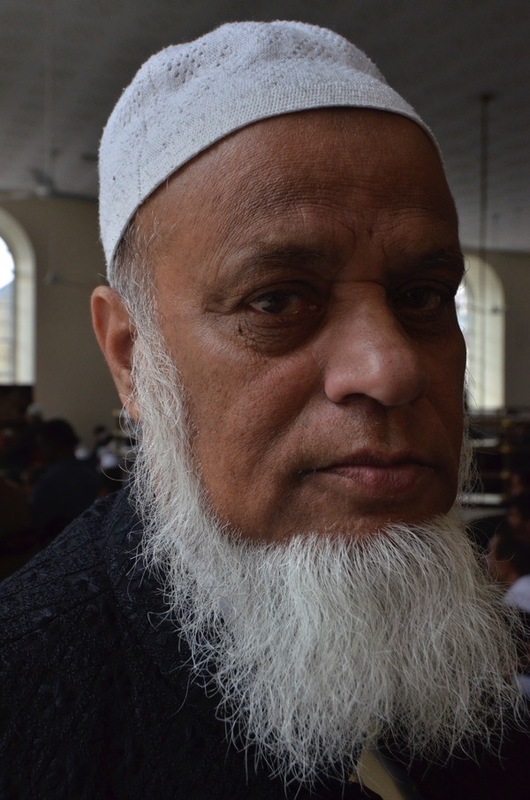 By then, and like the mosque itself, it was transformed into a primarily Sylheti school, within a poor Sylheti neighbourhood. Suddenly it no longer felt as if the story Bob & I had gone to tell about this building was just about bricks and mortar, or something located in the past, something distant and opaque. The things we were discovering were pieces, or fragments, of a living continuum that connected us. On the top floor, under the criss-crossing beams of the roof, two large, round windows flank both ends of the building. One looks out onto Brick Lane and the East, and the other onto the City and the West – the iconic mapping of Spitalfields. Up here, Quranic classes are held each day. It is where Torah (and I would like to think Bible) classes were also taught. 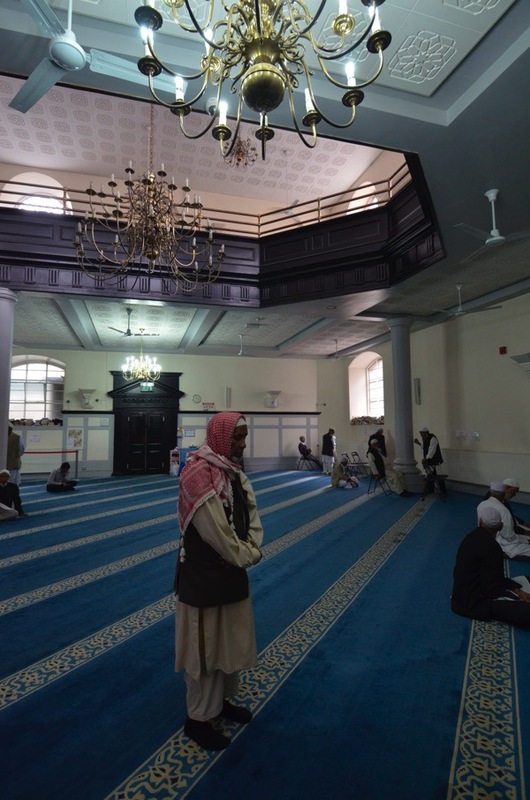 The space is painted in primary school colours with drawings and stories of the life and times of the Prophet Mohammed written by children hanging on the walls. Bob photographs a pair of sandals abandoned in the corridor (making us speculate how the owner managed to get home). I wander around the deserted classrooms. Outside one of them is a plaque that is dedicated to the memory of Deborah Kay who died on 17 Tamuz 5683, or the 1st of July 1923, with Hebrew writing above the English text. Just then a booming, rumbling noise echoes around and through the walls like the sound of a hungry mechanical stomach. Something that my mother once said comes back to me and I feel a cold shudder through me. Apparently, my youngest brother who attended classes here told her that there were djinns living up here. In Islam, djinns are spirits created by Allah to live on earth and, like humans, can be good or bad. 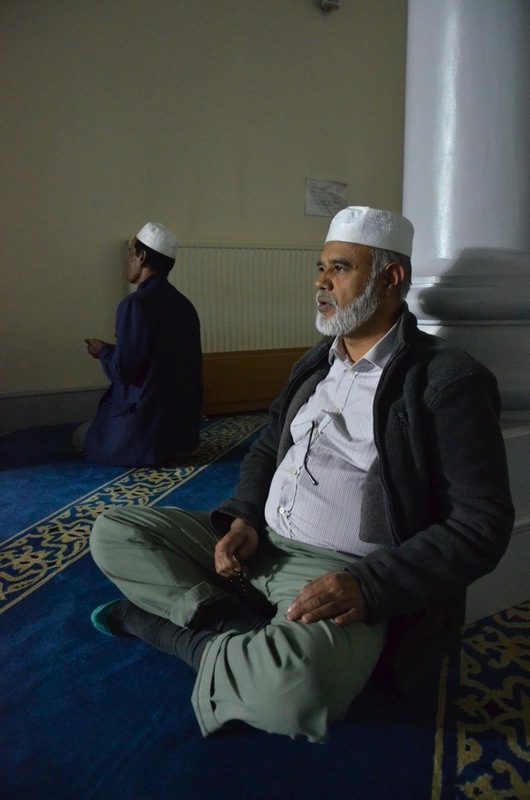 If they are in the mosque, then they must be friendly ones – I console myself – but I cannot get the thought out of my head. Eventually Bob finishes photographing the sandals. 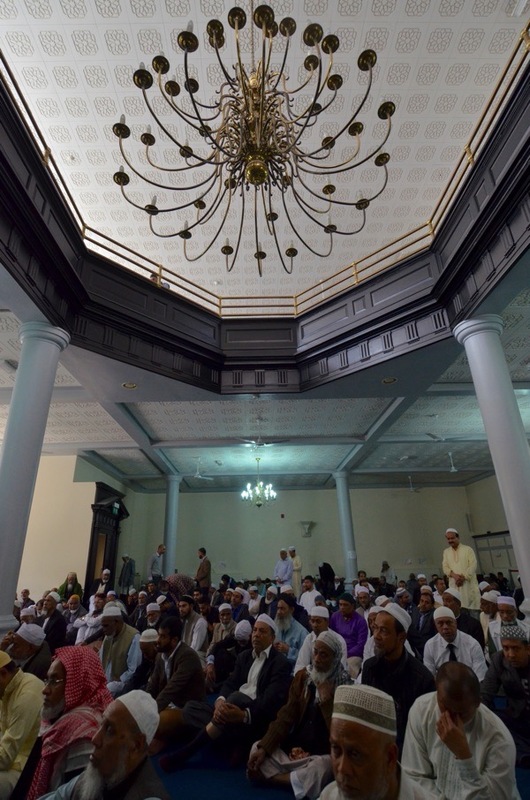 At midday, the prayer hall is flooded with light. 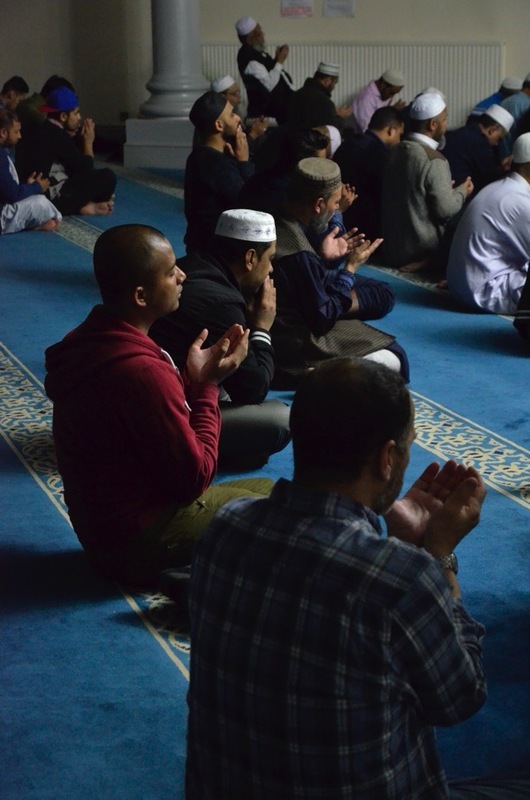 Jummah is the most important congregational prayer of the week and it is also Ramadan, the month of fasting for Muslims from sunrise to sunset. 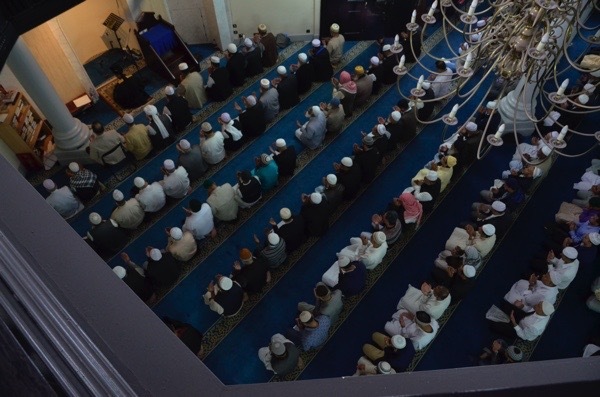 Consequently, the mosque is busier than usual. 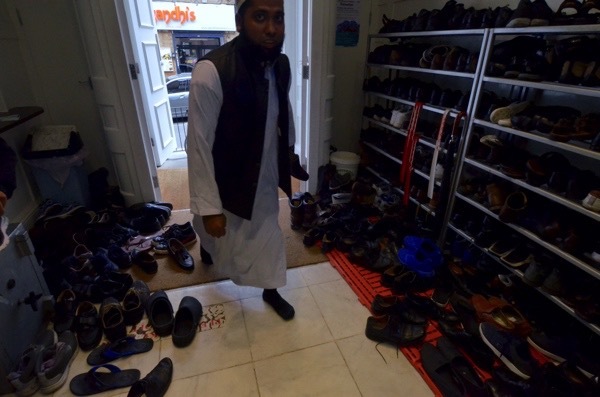 There are piles of Qurans placed neatly on most available flat spaces, bottles of rose water and perfumed oils, wooden rawals (mini-lecterns where the Quran is placed) and hats. A notice tells people not to dry their wet socks on the radiators. Beautiful brass chandeliers, similar to the ones over the road at 19 Princelet St and the Bevis Marks Synagogue dangle from the ceiling. When I was younger, I was fascinated by these wondering what it would be like to swing from one to another, Tarzan-style. 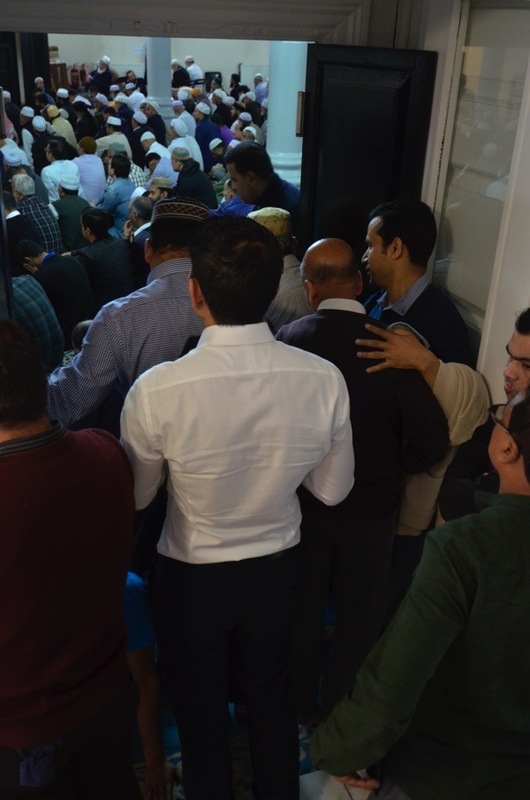 Men in sharp, expensive suits and briefcases, who work in the city, enter and are joined by men in distinctly North African hats and long jelabas that skim the floor. 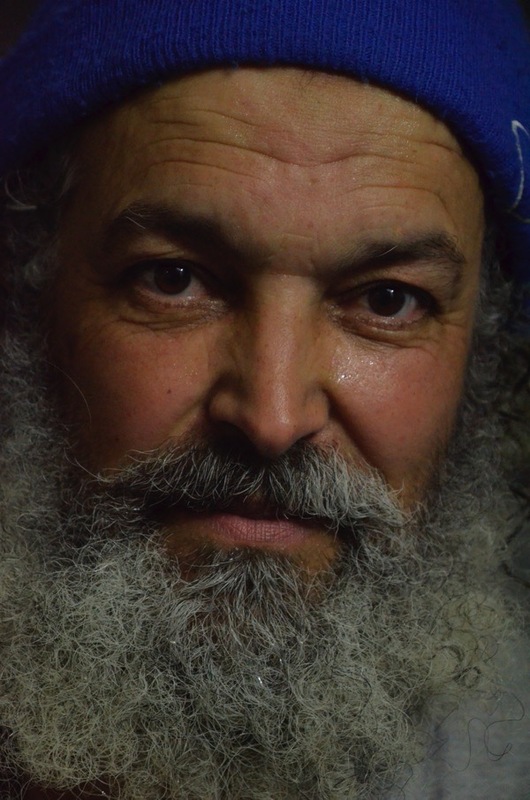 Men from Afghanistan and Pakistan wear their ruby-jewelled hats and shirt-dresses, central Europeans, Eastern Europeans, Somalians, Nigerians, Malaysians – restaurant waiters, shopkeepers, accountants, doctors, physicists, cabbies, accountants. Ties, turbans and t-shirts. There are men with blond hair, black hair, brown, blue and ginger hair, grey and white hair. Men with hoodies and hats, shawls and handkerchiefs. One has a cap with SWAG written in gold lettering. 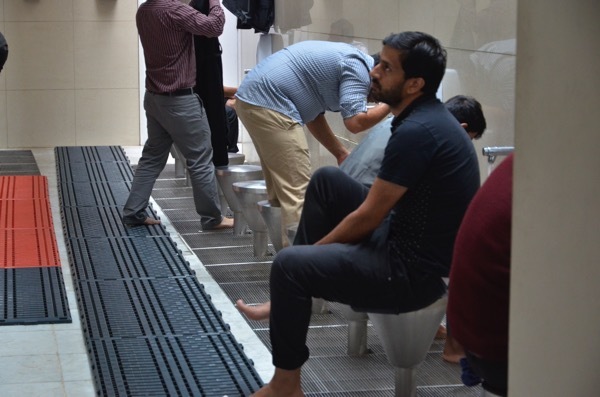 Some come into the hall dripping in water having performed ablution, the ritual wash in the courtyard besides the hall. A blind man walks in touching the walls with one hand and holding a stick with the other. He stops exactly where he wanted to, hangs his coat on a hook and folds his stick, putting it under a bookshelf. He feels the ground with his feet and joins everyone else on the thick, peacock turquoise carpet. 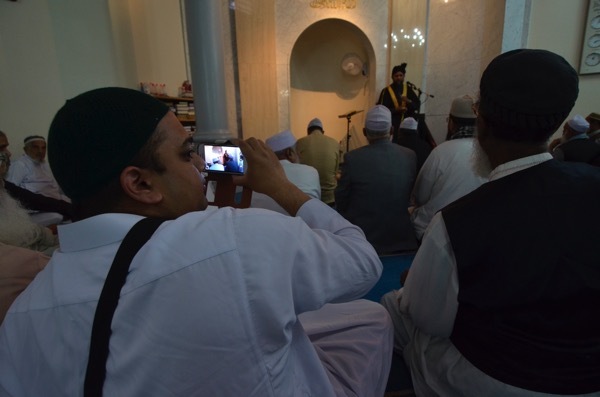 Resplendent in a long black robe, the head Imam of the mosque, Nazrul Islam, delivers the Friday sermon in Sylheti, part-singing and part-talking. 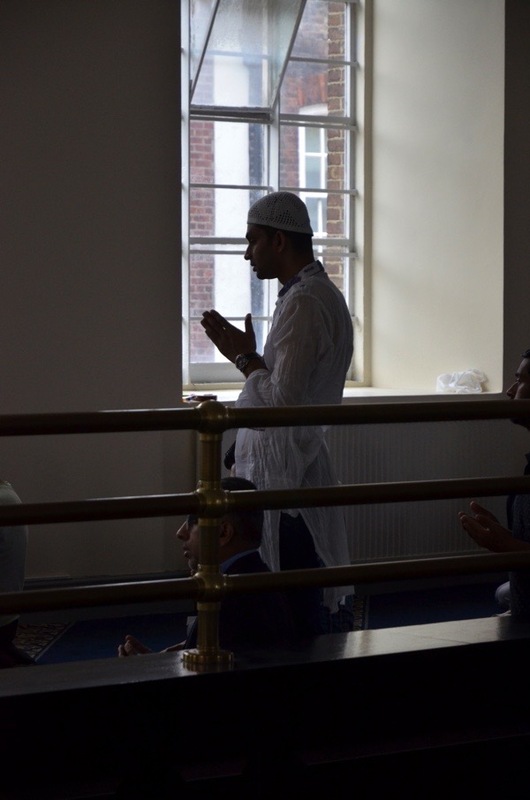 The subjects range from the importance of fasting during Ramadan, to forgiveness, the beauty and wonders of Paradise - and also the windows of the Grade II listed building. It turns out that they need replacing and it will cost thousands of pounds, which he hopes parishioners will generously donate. In the afternoon, a man with an electric blue jumper brings out a bucket and mop to swab the staircase, he cleans the wood panelling and wipes away dust that has no chance of settling. 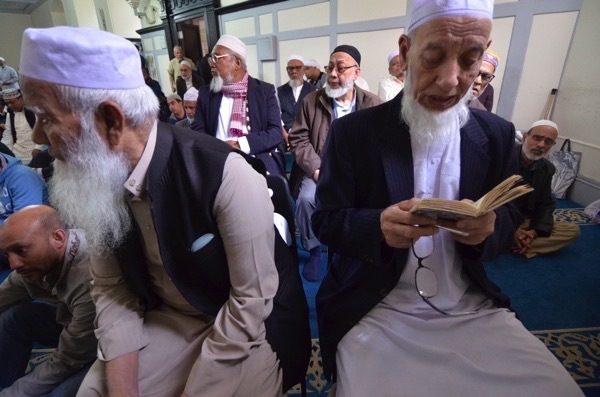 In the evening, there is a football match on the television, and shouts and yells of revellers outside intermingle with the snores from tired parishioners and the sounds of people reading the Quran – all now waiting until sunset when they can break their fast. I dont think the synagogue was destroyed during the Second World War. I visited it in 1970 while on a trip from Australia. My London relatives took me to a Jewish men’s breakfast club at the synagogue. Allahu Akbar Yes indeed God is Great; This is a well laid out description by Delwar of a call to prayer with an early start. Every picture by Bob captured much devotion, with a certain peace and serenity. 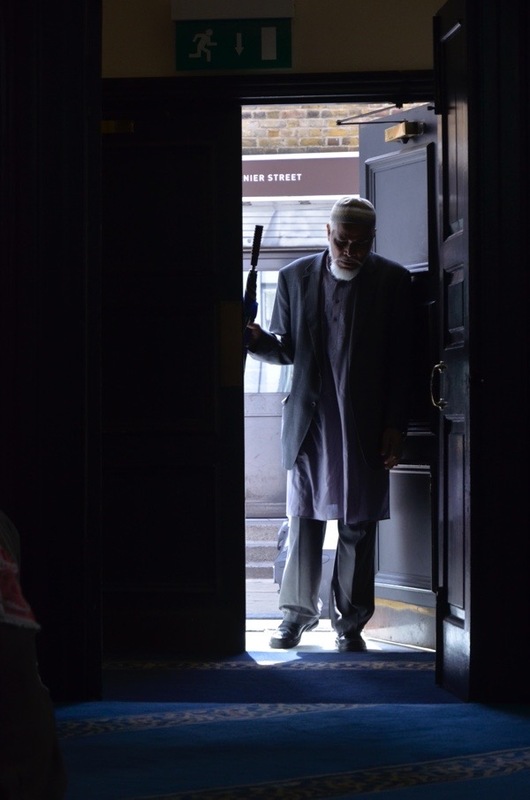 The building has had many religious makeovers now it is the turn of the Moslems, the parishioners here are devoted to this Brick Lane Mosque it is their spiritual home or place. They do look after the building with great reverence long may they stay. Well written and, Delwar and photographaped Bob. What a lovely start to the day (today) and the immigrants of spitalfields festival 19-21 June 2016. Thank you. Very enjoyable read. Well done for capturing the essence of this historical building and the community it serves. Beautiful, atmospheric and interesting historical perspective on quite radical changes over what is a relatively short period of time. Love the pictures. This article and these photograph deserve to be on the front pages of our national newspapers this week. 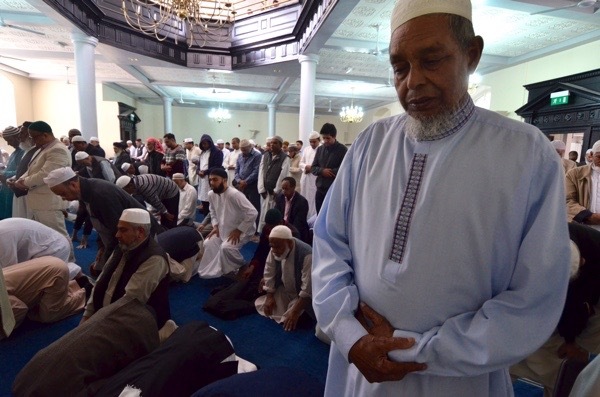 Thank you *so* much Delwar and Bob and the Mosque (via the GA here). The celebratory occasion is especially poignant this week-end. I love the narrative, powerful and simply told, and the visual visit – very inclusive. Reading this has lifted my spirit, and heart today. lovely images and excellent writing….. Very intesting to read. 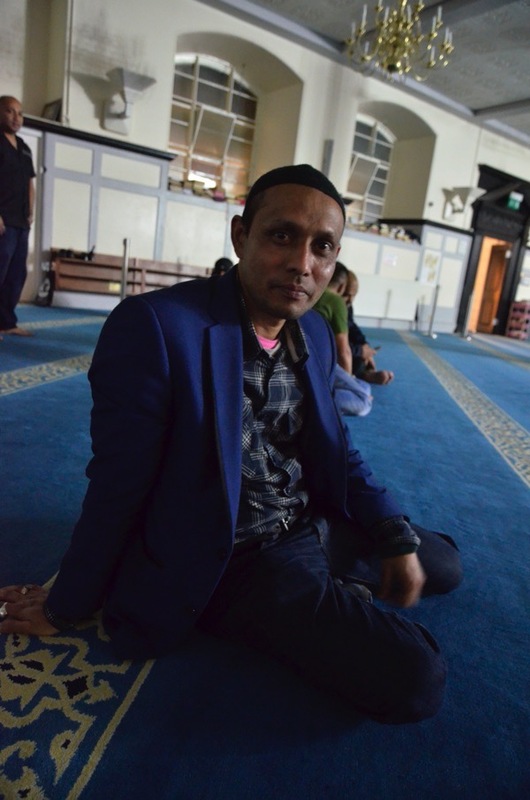 I learnt so much about the mosque and the immigrants of the past days. My congratulations to the auther and the photographer. A fine and finely illustrated piece and I look forward to its second part tomorrow. I wonder if the balcony is the former women’s balcony when the mosque was a synagogue. It was closed and sold in 1975.